SAN MARCOS — Montana weather has a slightly different feel than San Marcos in mid-November. 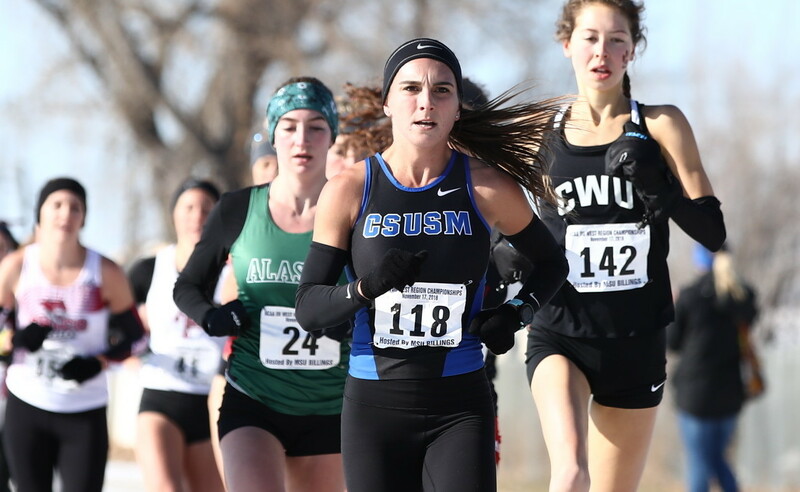 But California State University-San Marcos cross country runner Lisa Flora withstood snow and sub-freezing temperatures to finish 12th overall in the women’s 6k race at the NCAA Division II West Region Championships at Amend Park in Billings, Montana. Flora, a redshirt senior, finished in 21 minutes and 35.8 seconds, earning an at-large bid to the NCAA Division II National Championships for the second straight season. Flora was the only member of the women’s team to qualify for the national competition on Dec. 1 in Pittsburgh. Flora, an Escondido High School graduate, is majoring in sociology and criminal justice and plans to work in law enforcement after college. She has received all-academic honors several times while at CSUSM. Cougars men’s and women’s cross country coach Torrey Olson said that Flora showed perseverance in bouncing back from an injury this past summer that dated back to the spring track and field season. He said she was the most veteran women’s runner on the team and the top returner from last season, which saw five of top eight runners leave for graduation. “The goal for her at this time is to go there and become an All-American,” Olson said. The Cougar women’s team finished ninth overall. Vahagn Isayan took 16th place (31:34) to lead the Cougars men’s team in the 10k race, which finished seventh of 24 teams. Shea Vavra, who attended Escondido High School, finished 24th with a time of 31:44. California State University-Chico (Chico State) won the men’s race, with all seven of its runners in the top 20 and its top five scoring runners all in the top 14. On the women’s side, Alaska Anchorage came out on top, with two of its runners placing first and second in the race overall and another in sixth. At the end of the day, Olson sees a bright future for both programs and is happy with how his first season leading the Cal State San Marcos program transpired.